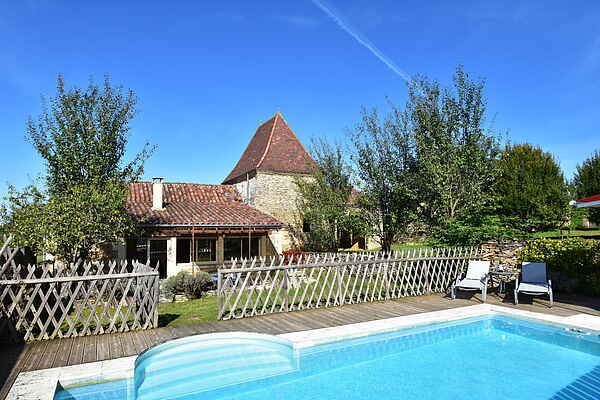 This detached house with a convenient location is situated in this beautiful part of Saint-Genies in the Dordogne. The semi-covered terrace to the south makes being outdoors more enjoyable. The children can have fun in the pool (with massage jet) or on the playing field behind the house. Meanwhile, you can have a glass of wine and get the barbecue ready for the evening meal. During the day, you can discover the local area. The medieval town of Sarlat-la-Caneda (16 km) is worth a visit. Or perhaps you can take a walk through the beautiful 18th century gardens of Jardins d'Eyrignac (13 km), the caves of Lascaux (12 km) or the lovely Château de Puymartin (20 km). Sporty daytime activities, with a canoe trip (canoe rental in Saint-Julien-de-Lampon, 20 km) across the Dordogne are also an option. Tomorrow you can travel further afield, for example to a game on one of the beautiful golf courses in Vitrac (25 km) and Chabournac (22 km), both with 9-holes, or in Brive (38 km, 18-holes). Visiting Gourdon (47 km) is also highly recommended.